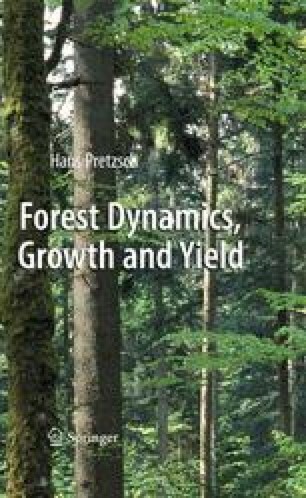 The introduction points out the very specific system characteristics of trees and forest stands which determine the approach and methods to analyse and model forest stand dynamics, growth and yield. Like other disciplines, forest science looks with an ever-increasing spatial and temporal resolution on the functions and structures of woodlands, forest stands, trees, tree organs, plant cells…. This makes it necessary to discuss concepts for bridging the growing gap between an increasing amount of knowledge on structures and processes on temporarily and spatially highly resolved scales (chemical, biochemical, molecular-biological processes), and an information deficit on more strongly aggregated system levels (stand, ecosystem, landscape scale). The reconciliation between progressing reductionism on the one hand and the demand for holistic system knowledge for forest ecosystem management on the other is a general challenge to forest science and other “green sciences”.